These Irish Flag Jellies are for funny rather than learning any culinary skills ~ the only thing you will have to actually make is the white jelly. However, to allow each layer of jelly to set, around two hours per layer, you would probably need to make them the day before they are to be eaten. 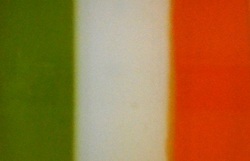 When I first had the idea for ‘Irish Flag Jellies’ it was the white jelly part that threw me into a tailspin. I asked my twitter friends and they had some good suggestions and I also looked on the internet for recipes for white jelly. The recipes I saw on the internet mainly used coconut milk and I didn’t want that as I don’t think the taste of coconut would be right for this particular white jelly. I wanted a fruit flavoured white jelly as the jellies either side were lime flavoured and orange flavoured. I couldn’t find an exact recipe to fit the bill and so experimented myself. As I said, I wanted fruit flavour and nothing else and so I hit on the idea of using ordinary (cows) milk, watered down so as to avoid the taste of the milk itself. The milk gave me the whiteness I wanted and the water, lemon and sugar took away the taste of milk. The end result is somewhat denser than the green and orange jelly but it is lemony and the colour is perfect. In this recipe I added lemon flavouring to the milk/water mix and infused the peel of a lemon in it for extra zing. Initially I used fresh lemon juice which of course curdles milk. I did managed to get real lemon flavoured milk/water and remove the curd by double sieving with kitchen paper, but it is a lot of fuss and so for ease of making, I am using the lemon flavouring for the recipe here. NOTE: DO NOT make the white jelly until AFTER the green one is set in its glass. It is very important that you follow the ‘METHOD’ steps here exactly as they are as you can’t make the 2nd and 3rd jellies in advance as they will set and not look as good in the glass. So gather your ingredients and utensils first and then read the ‘METHOD’ BEFORE you begin. 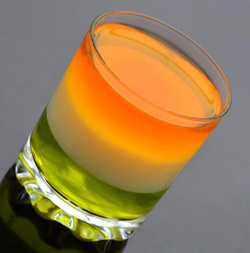 The Irish Flag Jellies recipe is essentially about the look so you want the end product to be seen to its best advantage. 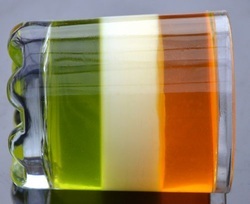 I recommend using straight sided tumblers to show off the ‘Irish Flag Jelly’. The ones I used measure 3.5”/8.5 cm high and have a diameter of 3”/7.5cm. It is important when you are measuring your glass that you take into account the base measurement. Measure the inside of the glass and the outside and the difference is the base so take that into account when measuring in your green, white and orange jellies to equal depths. Use a ruler rather than a measuring tape as it is much easier to use when measuring the jellies into the glasses. Get your utensils and ingredients together first to make sure you have everything before you begin. Remember to read the 'Method' before you begin. 8. Once the liquid in the pan is cold, add the agar flakes and place the pan on a low heat. DO NOT stir the flakes at this stage. 1. Take the glasses with the green layer of jelly from the fridge and quickly and carefully pour the white jelly on top of the green to the next third level. 6. Your Irish Flag Jellies are now ready to present and eat. 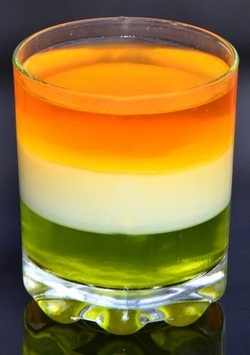 NOTE: as there is milk in the white jelly layer, the Irish Flag Jellies should be eaten within a day or two of making. VEGETARIANS: I have made my white jelly using agar flakes which are vegetarian but you can use gelatine if you would prefer. When buying the green and orange jellies, read the ingredients if you are vegetarian as many of them contain gelatine which of course is not vegetarian. PURE JELLIES: If don’t want to use packet jellies for the green and orange jellies you could make up them up using freshly squeezed and sieved lime juice for the green layer and orange juice for the orange layer. Add sugar when making if needed and remember that you will need about up to a third more agar flakes to set acidic fruit juices such as limes and oranges. You could use extra food colouring if desired.